I still had some tomatoes, peppers, beans, cucumbers, carrots, herbs and celery growing out back, so I picked what would imminently perish with tonight's chilly weather. 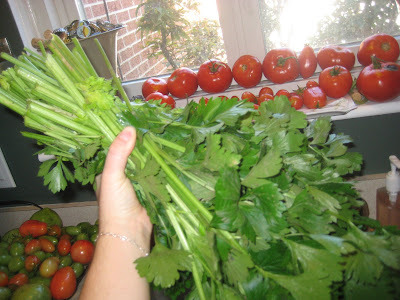 Here is my crop of celery... it smelled delicious! 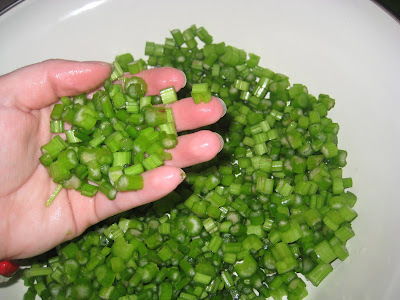 I sliced and diced and prepped my celery for home made chicken noodle soup later this Fall/Winter. 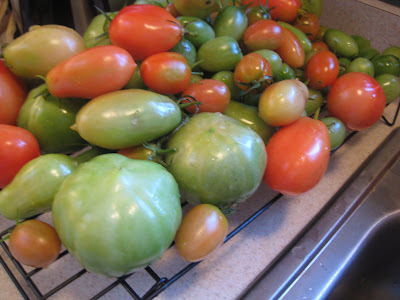 I picked the rest of my tomatoes and I have them in a sunny location resting on a cake cooling rack to finish ripening. I did the same thing last year with my green tomatoes and I was able to enjoy my harvest for about a month after the first frost!!! I read on another blog (drawing a blank which one! Sorry!) that she freezes her tomatoes until she is ready to make spag sauce or whatever and when they start to thaw the skins come right off!! Look at all your tomatoes, Laura! Yum. How many plants did you have? Just curious...beginning to dream about next year's garden! I purchased 12 plants, had three given to me by a friend, and then I transplanted another 15 "surprise" plants that grew from seeds that dropped from last years plants! I love tomatoes!!! Here's a trick I'm going to try with my fresh herbs: I have huge basil, parsley, rosemary, and oregano plants, and what I've heard is that you can take a food processor and make an herb "slurry" with fresh herbs and water, then freeze it in ice cube trays and use the cubes to flavor soups, stews, sauces, etc.